Buhari’s Greatest Achievement So Far Is The Harrasment Of PDP, Says Fayose. 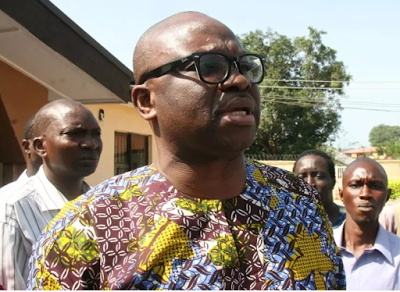 Ayodele Fayose, governor of Ekiti state, says the harassment of leaders of the Peoples Democratic party (PDP) is one of the achievements of President Muhammadu Buhari since he assumed office. A fierce critic of Buhari even before the president came into power, Fayose said he would continue to speak out against perceived ills of the current administration no matter the level of intimidation. “Rather than concentrate and make a difference within his 100 days in office, the president’s greatest achievement so far is harassment of PDP leaders, appointment of his in-law and kinsmen into sensitive positions, selective fight against corruption and arrest and detention of INEC officials who worked in states won by the Peoples Democratic Party (PDP),” read a statement issued on his behalf by Lere Olayinka, his spokesman. Fayose said the national peace committee has the interest of the president at heart and advised Buhari to heed the advice of the group. He alleged that the committee counseled the president not to involve in undemocratic acts, faulting the approach of the federal government in the fight against corruption. “President Muhammadu Buhari should tread cautiously and be mindful of the body language of those hailing him today,” the statement read. “The president should be cautious enough to know that the former head of state, General Abdulsalami Abubakar-led national peace committee tactically told him to tread cautiously and be mindful of the fact that he is not heading a military government. “The peace committee has reminded the president that he is not heading a military government and with the calibre of Nigerians in the committee, their wise counsel should not be ignored. “These are Nigerians who don’t need personal favours from the president and he should get the message very clearly that he is being told not to act as a dictator.